LinkedIn supports programmatic refresh tokens for a limited set of partners on a case-by-case basis. Refresh tokens are used to get a new access token when your current access token expires. For more information, see the OAuth 2.0 RFC. LinkedIn offers programmatic refresh tokens that are valid for a fixed length of time. By default, access tokens are valid for 60 days and programmatic refresh tokens are valid for a year. The member must reauthorize your application when refresh tokens expire. 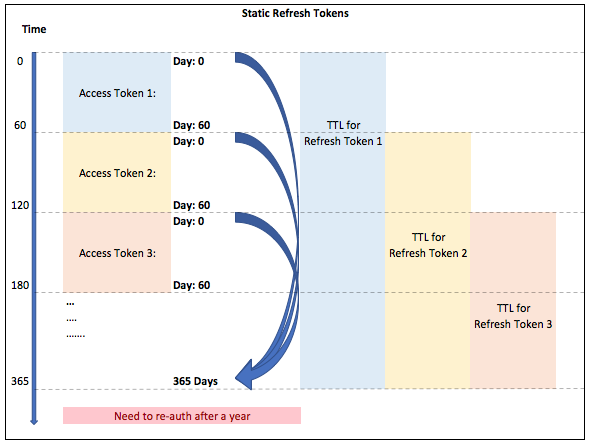 When you use a refresh token to generate a new access token, the lifespan or Time To Live (TTL) of the refresh token remains the same as specified in the initial OAuth flow (365 days), and the new access token has a new TTL of 60 days. Day 1 - Your refresh token has a TTL of 365 days, and your access token has a TTL of 60 days. Day 59 - If you generate a new access token using the refresh token, the access token will have a TTL of 60 days and the refresh token will have a TTL of 306 days (365-59=306). Day 360- If you generate a new access token, your access token and refresh token will both expire in 5 days (365-360=5) and you must get your application reauthorized by the member using the authorization flow. refresh_token — Your refresh token for the application. This token must be kept secure. refresh_token_expires_in — The number of seconds remaining until the refresh token expires. Refresh tokens usually have a longer lifespan than access tokens. Refresh tokens are approximately 500 characters long. We recommend that your application stack be made to handle tokens of at least 1000 characters to accommodate future expansion plans. This applies to access tokens as well as refresh tokens. A successful request returns a new access token with a new expiration time and the refresh token.